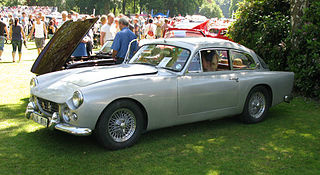 The AC Greyhound sports car, was launched in 1959 and, at first sight, somewhat resembled an enlarged Aceca, even though it was a totally redesigned model. 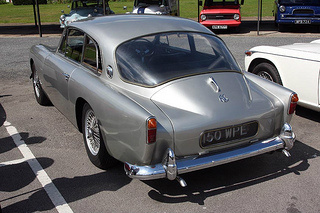 In 1958, the dated two and four seater AC 2-Litre saloon was finally discontinued, at which point it was realised that what was now needed was a sporty family four seater. Hence the Greyhound. It had a new, square tubular chassis, and was both lighter and slightly small er than the 2-Litre saloon, and was not short of internal luxury. Interestingly, the front/rear weight distribution was 50/50. The prototype Greyhound was premiered at the 1959 London Motor Show, where its body styling was not well received. However, this was addressed in the production version, which included a wrap around rear window, and a smaller front grille. 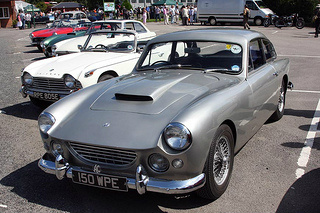 The 1971 cc Bristol powered Greyhound, built between 1961 and 1963, and fitted with an overdrive unit, produced a top speed of 115 mph, with a 0-60 mph time of 9.0 secs, and an overall fuel consumption of 22 mpg. Production ended in 1963 when a total of 83 Greyhounds had been built, of which three were constructed with left hand drive. Its lacklustre sales performance was due in part to the lack of an adequately powerful engine, coupled with indifferent road test reports. Of the 83 Greyhounds, the vast majority were fitted with the straight 6-cylinder Bristol engine in either the 2 litre or 2.2 litre versions. In fact, records have shown that only three Greyhounds were powered by the 2.6 litre Ford Zephyr engine.